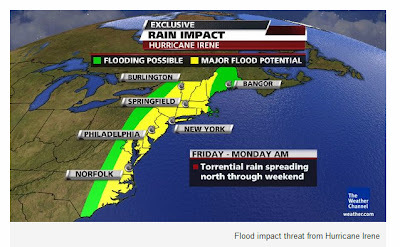 After I had stumbled out of bed this morning and grabbed a cup of coffee, I plunked myself down on the couch in the living room and turned on the TV to see if I could get the latest forecast on Hurricane Irene. I was rather hoping that I'd hear that Irene had jogged to the east and wouldn't be the catastrophic event that they had been talking about when I'd last heard a forecast last night. 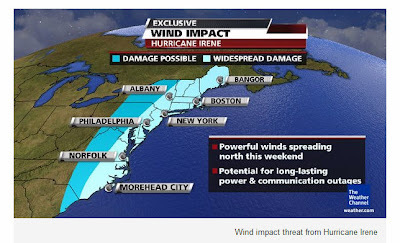 Turns out that Irene had indeed shifted to the east but only enough to miss hitting the Jersey Shore directly on a path that now has her pointed dead center towards Connecticut. Oh dear. According to the weather gurus at The Weather Channel, "Hurricane Irene is set to become one of the more destructive hurricanes to hit the East Coast in at least several decades." 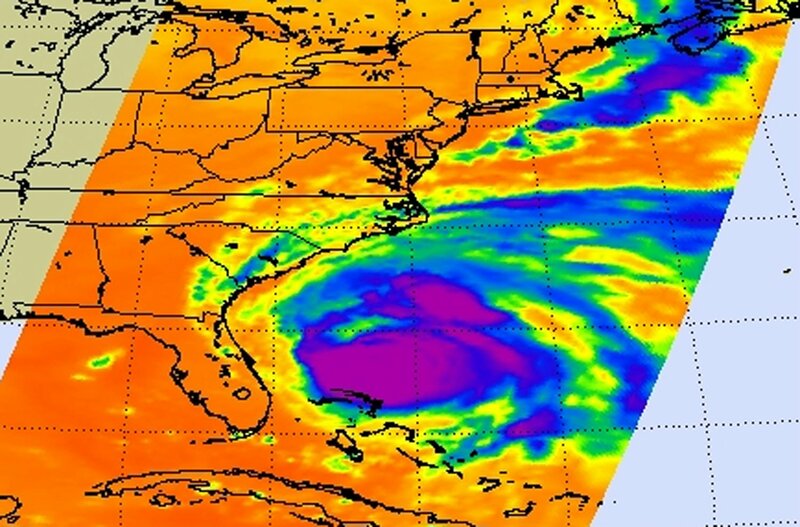 You guys know that I love history but I'm not exactly too thrilled about the idea of living through history being made - especially in the form of one of those most historically damaging storms to hit the East Coast since either Hurricane Gloria in 1985 or the big Hurricane of 1938. Obviously I wasn't around during the Hurricane of 1938 and when Hurricane Gloria hit Connecticut in late September of 1985, I was living clear across the country in Stockton, California so I wasn't here when Connecticut received the worst of the hurricane and tree and structural damage was massive. Along the coastline, storm surge and strong waves washed away several fishing piers and some roadways were underwater during the storm's passage. In other words, it was a mess and I remember that my parents were without power for almost two weeks in their small town of Canterbury. The last hurricane to hit the East Coast was in August of 1991 when Hurricane Bob blew in from the tropics and made landfall twice in Rhode Island as a Category 2 hurricane. On August 19th, Bob first hit Block Island and then Newport before he continued north where the storm made landfall in Maine as a strong tropical storm early on August 20th. Turns out I wasn't around for that storm either as I was in New Hampshire on my honeymoon where we experienced a lot of rain and some wind but nothing like what the folks back home in Connecticut went through. So I've been lucky and dodged a few bullets but it doesn't look like I'm going to be dodging this one. As a matter of fact, it looks like I'll be riding this one out at work and keeping my fingers crossed that people don't feel the need to call 911 for non-emergencies like they do every other day of the week. Of course, I know in my heart that they will and then I'll have to worry about sending men and women that I care about out into a storm of epic proportions to take someone with a swollen finger that they've had for two weeks (or some such nonsense) to an emergency room that's going to be just as frustrated as we are. This worries me. As much as I might be worried about whether or not the big tree on the side of the house that the landlord should have taken down already is going to blow over or the tree in the back of the house near the garage that's already leaning dangerously to the right is going to finally topple into the driveway, I worry about having to send regular men and women out in regular vehicles into a storm with winds that could easily blow that vehicle and the crew inside of it off the road. As much as the EMTs and Paramedics that I work with might sometimes want to think that they're superheroes driving around in rolling fortresses, they aren't and to put them in danger for something non-life-threatening causes me grave apprehension. It is my hope that the State Office of Emergency Management puts some sort of plan into effect that will keep us from having to do something like that but too many people have come to think that 911 is a magical number that summons magical beings to their door regardless of what the weather outside may be doing. They forget that police, fire, and EMS personnel are just as human as they are and that heavy winds and rain are just as threatening to them as they are to the people calling 911 for help. It is my hope that no matter what does or doesn't hit us in the next coming days that people use some common sense. Unless there's a darned good reason for you to be out and about - stay home. I don't care if the local bar is having a "Hurricane Party" and offering cheap food and drink - stay home. I don't care if you think this is a good time to go to the casino because maybe it won't be crowded - stay home. I don't care if you really want to drive to the coast and see the storm surge - stay home. I don't care if you really need a cup of coffee and the local Dunkin Donuts was foolish enough to open and put their employees in potential danger - stay home. And if WalMart feels the need to be open like they always are just in case someone needs snacks during the storm - stay home. Please think twice about the fact that when you decide to ignore the warnings of the Emergency Management Centers and everyone else that has been monitoring the storm, not only do you put yourself in danger but you put the lives of everyone else who now has to go out to try to save you in danger also. It's not like there hasn't been plenty of warning that this storm is coming up the coast; there has been plenty of time to "hope for the best but prepare for the worst" and I sincerely hope that's what everyone has been doing. Stay safe and please, stay home - unless of course you've been told to evacuate but that's a completely different story! I always listen, but I was in the business of being in harms way when these kinds of things happened. Some people just don't use the brains the good Lord gave them. I've always listened, too. I'd much rather be over-prepared, if that's possible, than under-prepared. People tend to underestimate the damage that storm surge is capable of creating. And that ain't good. I hope the building where you work is safe and secure. I also hope and pray that the vast majority of people exercise some common sense. You know there will always be some that don't exercise any at all. Stay safe! Update facebook, tweet or text to let us know you're OK! It sounds grim there. Everyone batten down the hatches until it is all over. Pack a cake, blanket and pillow... It may be interesting. you and everyone else is in my Prayers.